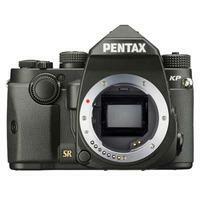 With 24.32 megapixels, the Pentax KP DSLR in black is a high-resolution camera that boasts a new-generation APS-C CMOS image sensor and high-performance imaging engine. Dustproof, weather-resistant, and cold-proof down to -10°C, its magnesium-alloy body is compact and lightweight. It features a 5-axis shake-reduction system, a maximum ISO of 819,200, 1080p video recording, and a 27-point autofocus system.